Spaghetti Carbonara – Satisfying Family Meal For Less Than a Fiver! I recently overheard a conversation between two mothers, talking about the cost of food. One was saying she finds it impossible to make a meal for less than £10 for her family of 4. I was a bit shocked, as I could think of plenty of meals that could be made much cheaper. I decided to go home and come up with some tasty and satisfying meals which would cost half of that price. 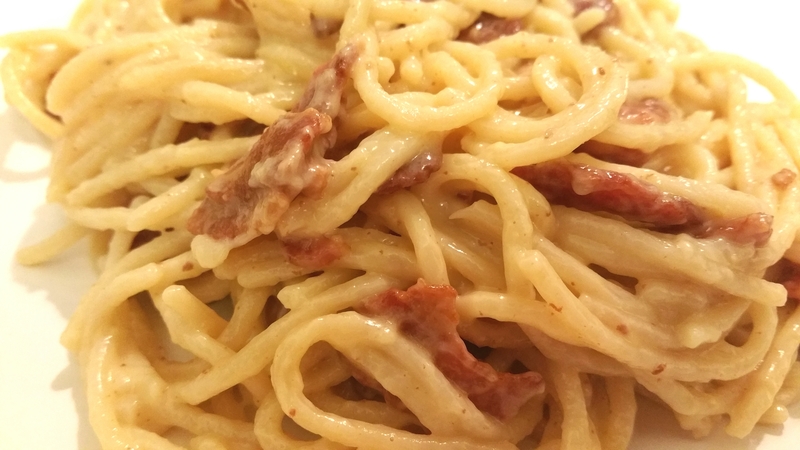 The first recipe in my #FeedAFamilyForAFiver series is this delicious Spaghetti Carbonara. It is such a simple and quick meal to make, so perfect for when time is limited. I based the meal price on the cost of ingredients in Tesco, as that is my local shop. I did look on Asda’s website at their prices too though and it worked out pretty much the same. It could be made even cheaper by using eggs from caged hens, but I never ever recommend that, so this recipe uses free-range eggs. Apart from not wanting to support the sale of caged hen eggs for compassionate reasons, they don’t taste anywhere near as good as free-range either. Free-range yolks are much more yellowy-orange compared to the insipid colour of caged hen eggs, and the flavour is much better. 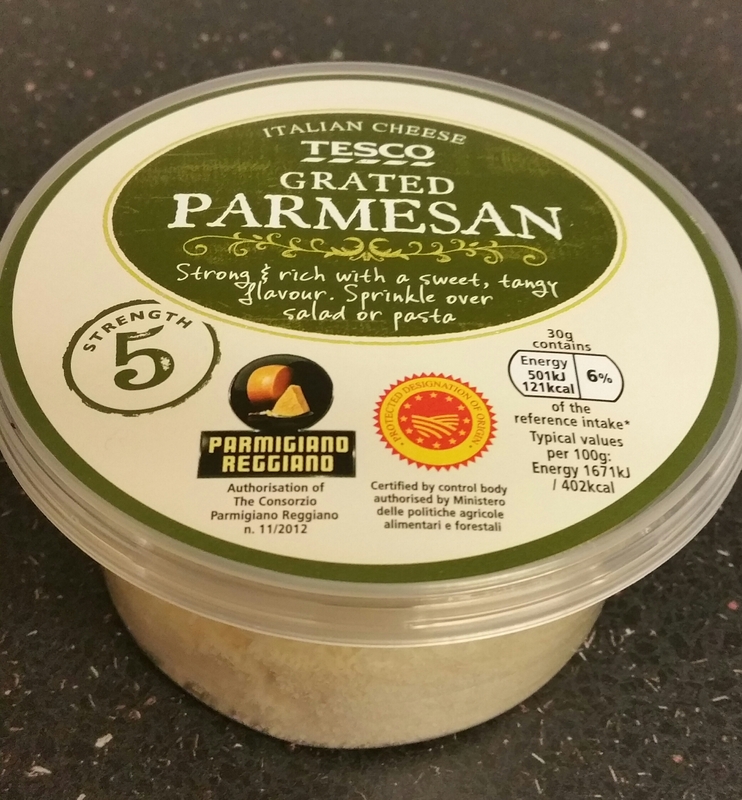 I have tried this meal with Tesco Value spaghetti which cost just 20p for 500g and another brand which cost £1, and I can honestly say there was no difference in taste, so you may as well stick with the 20p one for this recipe. Most recipes for Spaghetti Carbonara use pancetta, but I just used a pack of unsmoked streaky bacon and it was delicious. My son isn’t a huge fan of smoked bacon but if your family like it, by all means try it with smoked instead. Beat the eggs in a jug or small bowl and add most of the Parmesan cheese. Keep a little bit of the cheese to one side to sprinkle on the cooked meal if wanted. Cook the spaghetti according to the instructions on the packet, usually for around 8 minutes, until cooked but still slightly firm to the bite (al dente). Remove from the heat but do not drain it. While the spaghetti is cooking, use kitchen scissors to cut the bacon into small pieces. (Bear in mind that the bacon will shrink as it is fried, so don’t cut them too small). 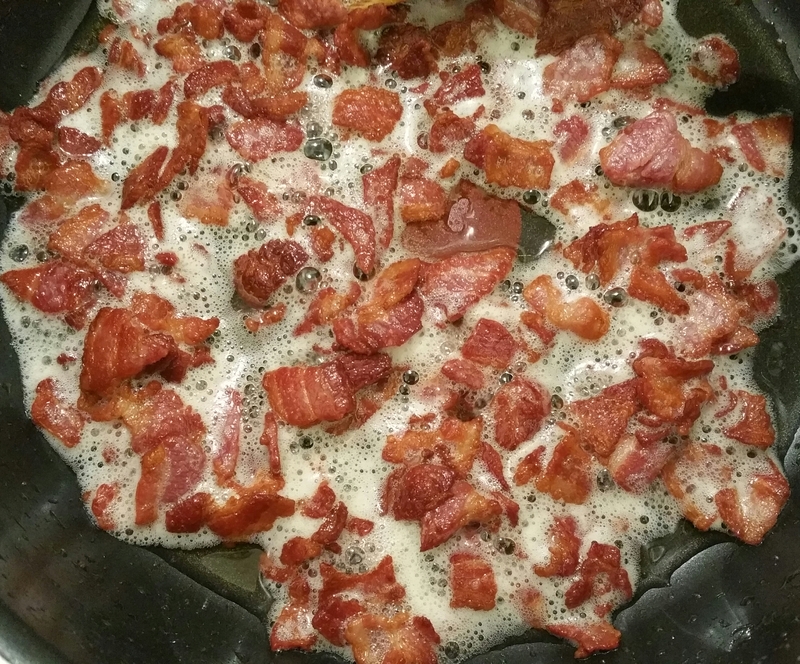 Melt the butter in a large non-stick pan and add the bacon pieces. Fry over a medium heat until the bacon is brown and crispy. Turn the heat down to low. (You might be thinking there looks like too much butter in your pan now as the bacon fat has added too, but it is all needed so don’t worry). Use tongs to lift the spaghetti and place it in the pan with the bacon. Toss the bacon and spaghetti together, letting the butter and bacon fat coat the spaghetti, until the bacon is evenly distributed. Remove from the heat. Pour the egg and cheese mixture on to the spaghetti and use the tongs to toss it together, making sure the spaghetti is all coated with the mixture. Add 3 tbsps of the spaghetti water and mix well. This will produce a lovely slightly creamy sauce without making it sloppy. Season with black pepper to taste. Serve, and sprinkle with the remaining Parmesan cheese if required. Enjoy! You might be wondering about the eggs now, and whether they are safe to eat as they are not cooked. Well, the answer is yes they are fine as they DO cook. You have to remove the pan from the heat before you add them or else they would simply scramble, and you don’t want that. The heat from the freshly boiled spaghetti, along with the hot butter and bacon fat, and the boiling hot spaghetti water will cook the eggs to a safe level while keeping them soft. I have made this recipe many times and none of us have ever been ill from it. In fact it is now a firm favourite with my son. There are only 3 of us so we have some leftover when I make it. My son loves it cold from the fridge the next day too! Here’s the ingredients price list to show how cheap it is to make. This is using Tesco ingredients. Total for the ingredients used – £4.08!! Ok so you don’t use all of the spaghetti in the pack but that’s only pence anyway. Obviously you can spend more if you use other brands, but the brands I used made a very tasty meal which we all loved. You really can keep the cost down without compromising on taste! I hope you enjoy it as much as we all do 🙂 Check back soon for another cheap but tasty family meal.